The desirability of sustainable residential choices, understood as satisfaction-with and aspiration-for, is a concern for policy-makers. Even though sustainable residential choices encompass both the built environment and the associated behaviors, it is mostly studied of its material components. 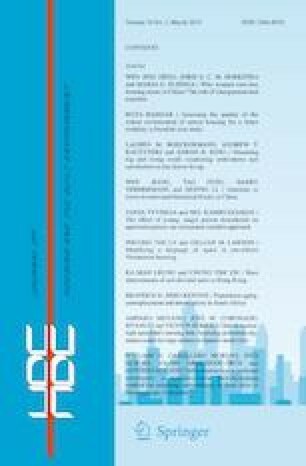 This study emphasizes the behavioral component by examining the extent to which working households are satisfied with their residential choices sustainable to different degrees and aspire to make similar or different choices in their residential projects. This study used the database «Demain Quebec» that is an Internet quantitative cross-sectional survey of residents of the Quebec City metro area detailing their household, residence and mobility characteristics. 740 households with at least one full-time worker were analyzed. The results showed that it is possible to have residential choices that are at once sustainable and desirable. However, households who had made such choices were less satisfied with the trees and greenery, quietness, and ambiance, security and characteristics of neighbors. Also, sources of dissatisfaction are not necessarily associated with moving intentions. The main reasons for moving are often associated with the desire to become a homeowner or having access to a larger residence. On their residential choice decisions, households regard mostly the environmental features which are in accordance with their needs and goals at a certain stage in their life and also with their dominant activities. Though the built environment plays an essential role in the achievement of desirable sustainable choices, the households are the protagonist in enhancing sustainable prosperity. Breheny, M. (1996). Centrists, decentralists and compromisers: Views on the future of urban form. The Compact City: A Sustainable Urban Form? 13–36. Retrieved from http://books.google.com/books?hl=en&lr=&id=ZAeZti784w4C&oi=fnd&pg=PA10&dq=Centrists,+decentrists+and+compromisers:+Views+on+the+future+of+urban+form&ots=1Sex0M44xz&sig=I_GyZQdhpZIJTACGBEkC2r_Oz9Q.